Carlotta the Great is the best lady balloonist in America, as well as Ariel's mother, and Ariel longs to ride in the basket herself someday. The thrill of Ariel's first hydrogen balloon ride is breathtakingly presented in this exciting story based on a real ballooning family of the 1800s. "It's the day of Alice's mother's important balloon race. Alice would like to be an aeronaut, too, but both her parents tell her she must wait until she's older. But maybe, just maybe, this might be the day for Alice to witness a race at close hand. Bonnie Kelley-Young's energetic narration moves at a fast clip, and she's an eager commentator on the event. Kelley-Young adds gusto to the mayor's race-opening remarks, authority to Carlotta's directives during the race, and excitement to Alice's airborne adventure. She's also resourceful as she suggests sound effects for specific words. Gentle music and background sound effects complete this read-along. " "Eleanor Coerr's beginning chapter book is based on the true account of one of America's most popular balloonists. According to the author's note at the end of the book, Mary Myers, who was better known as Carlotta the Lady Aeronaut, "made more ascensions in hydrogen balloons than any other aeronaut of her time." 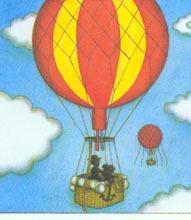 In this story, set in 1882, Carlotta's daughter stows away in her mother's balloon, unintentionally adding extra weight to the craft and almost costing her mother the race. Carolyn Croll's beautiful watercolor illustrations enhance the delightful tale. Bonnie Kelley-Young's narration is well paced, and appropriate sound effects and background music add to the telling. Page turn signals are optional. For public and school library collections."